Credit rating agencies are predicting quite a storm for the Russian economy, and they are therefore threatening to lower the country’s status to ‘junk’ level. Just as a weatherman may be incorrect about their storm predictions, so too may a ‘financial meteorologist’, except the latter has ulterior motives in doing so. S&P has joined Moody’s in launching an attack on the Russian economy, hoping that the threat of lowing Moscow’s credit status will somehow translate into political changes in Eastern Europe. Although such an idea may seem plausible in theory, in practice it’s absolutely disjointed from reality and merely symbolizes the third wave of the economic war on Russia. This coming economic storm, cooked up in the West, is going to come up against the multipolar storm breaker of Russia and China’s own Universal Credit Rating Group (UCRG), expected to become active later this year. When the waves inevitably crash, the West may find that it has unwittingly and irreversibly damaged its own unipolar economic defenses and opened up a flood of multipolarity. The US and the EU enacted selective and then generalized sanctions against the Russian economy and certain individuals, apparently under the false belief that Russia is Zimbabwe and can somehow be bullied via these means. They weren’t successful in this attempt and thus decided to escalate the conflict to the next level. This wave brought about the oil and currency war against Russia, opening up a Pandora’s Box of repercussions that may unintentionally spell the end of fracking in the US (or at least its suspension), among other things. Nonetheless, the main objective here was to destroy what is inaccurately viewed as the lynchpin of Russia’s economy (oil and gas) and create the conditions necessary for a Color Revolution. As with the first wave, the second one also failed to achieve its goals. Enter the third wave, which is what Russia is on the cusp of experiencing. The strategy here is to use institutional ratings agencies to damage Russia’s international economic reputation in the hopes that this can help ‘isolate’ it from the non-Western markets that it has recently (and quite eagerly) engaged. This plan is dead in its tracks, since Russia’s rating was worse in 2005 but it was consistently growing at around a 7% average during the period 2000-2008, showing the inherently political (and economically ineffective) nature of Western ratings. 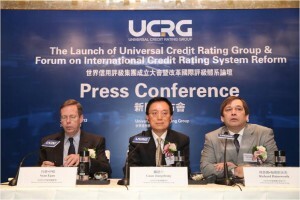 Shielding Russia and the multipolar world from the West’s politically minded economic ‘ratings’ is the formation of an alternative agency constructed in cooperation with China, the Universal Credit Rating Group (UCRG). This forthcoming buffer, if it can build the necessary trust and objectivity, could realistically help the non-West weather the oncoming ‘financial storm’ that the Western agencies are all hyped up about. The underlying idea behind this initiative is that the West has a unipolar monopoly on all manners of international ‘ratings’, be it economic, political stability/fragility, or terrorism. Given that there is a realistic and clearly discernable trend towards geopolitical multipolarity, it’s natural that this would eventually transition over into the economic sphere. The BRICS Bank and China’s Asian Infrastructure Investment Bank are examples of this, with the UCRG being the next institutional progression. If the non-West can free itself from the subjective ‘ratings’ and dictates of Western institutions, then it will be at liberty to pursue multipolarity as it sees fit. The ‘financial meteorologists’ may be in for a surprise when their politically constructed storm hits the multipolar breakers, as the resultant back-splash may reverberate with unintended consequences. Although it is still a relatively far time away in the future, especially considering the rapid and somewhat surprising transformations that have been taking place in all spheres over the past couple years, an increasingly possible scenario is beginning to take shape, and that’s the macro-structural division of the world into entities (not necessarily states) supporting the retention of the unipolar world and those advocating the construction of the multipolar one. This is seen in all spheres (as was earlier touched upon), and the creation of the UCRG, especially given the current ‘New Cold War’ context, must be understood as being the next logical extension of this. As the world divides itself into either the pro- or anti-multipolar camp, the emerging dichotomy will come to define international relations for the entire century or until one side capitulates. Given this dynamic, it is a very realistic possibility that certain states will ‘switch sides’, just as occurred during the ‘Old Cold War’, either by force (whether covert or overt) or by choice. Something that may sway various states towards multipolarity could be the creation of regional agencies and institutions to complement inter-regional (‘Greater Multipolarity’) ones, for example, a credit ratings institution specifically for Latin America. Likewise, if the unipolar world continues its political designations of supposedly impartial topics such as the economy and does so in favor of geostrategic on-the-fence states, it could find itself gaining new allies. No matter how things play out, though, it’s evident that a global competition is definitely taking place between the unipolar and multipolar worlds, and that this is being fought on all levels, including the financial institutional one described within this article. The West is poised to launch the third wave of its asymmetrical economic war against Russia, but it’s predictably bound to fail in inflicting the damage it has in mind. Russia and China, the two anchors of the multipolar world via the Russian-Chinese Strategic Partnership, are taking the initiative in creating an alternative institution to counter the West’s politically motivated economic ratings. This creates more openings for the actualization of full-spectrum multipolarity, whereby this concept makes the leap from the geopolitical to the institutional, with the long-term potential of rivaling (and perhaps unseating) the West’s ‘supremacy’ in the targeted fields. Importantly, however, this entire episode portends the division of the world into two camps, with the unipolar and multipolar worlds slated for their inevitable face-off sometime later this century.